There is a lot of talk about BPA in canned goods. BPA is used in many products. Canned goods are a concern because BPA is used in the linings of canned goods. Why should you avoid BPA? You can read all about that here. Eden Foods makes BPA free cans for their beans, but they don’t have canned tomatoes. According to the website, How Stuff Works, most organic brands of canned tomatoes do still use BPA in their liners. The article is very interesting because they actually do rate brands. You may be surprised at the ratings. 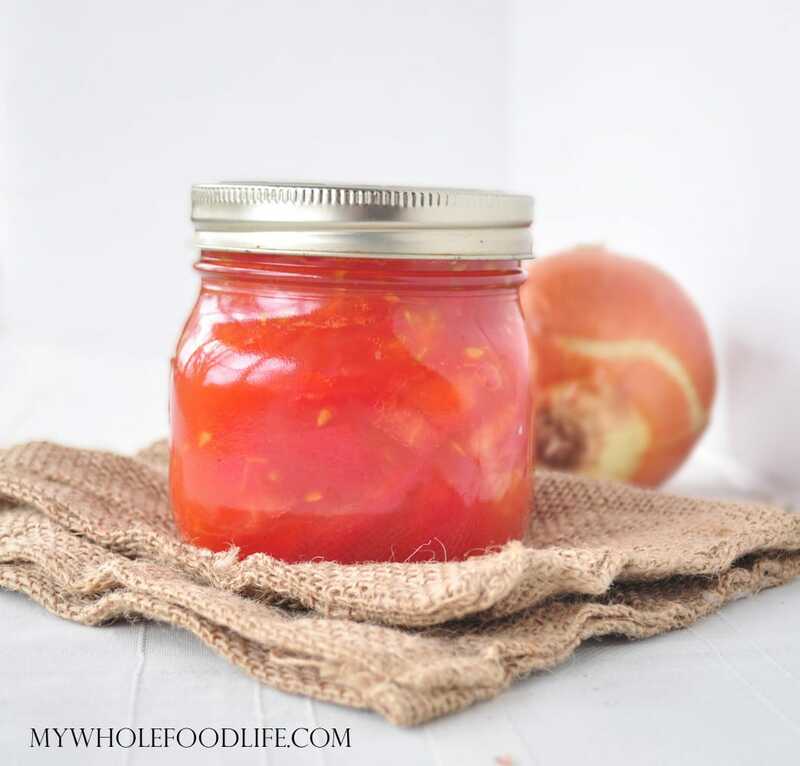 The good news is, it’s so easy to make your own diced tomatoes! It literally take just a few minutes. These homemade diced tomatoes would be perfect in my Crock Pot Tomato Sauce or my Sweet Potato Chili. These diced tomatoes can also be made in a larger batch and frozen. Say goodbye to canned tomatoes! Bring a large saucepan to a boil. Drop the tomatoes in the water. Leave them there for 1 minute, then drain the water, and throw them in a ice water bath to cool them down. About 1 minute. Once the tomatoes are cooled, you can easily peel the skins off. After the skins are peeled, dice the tomatoes. Put the diced tomatoes back in the sauce pan with the salt and any other seasonings you may want to add. Let them simmer for about 5 minutes. Remove and store. I stored mine in a glass mason jar in the fridge. You can freeze them as well. Just make sure you use a freezer safe container. This recipe make about 2 cups diced tomatoes. That is equal to a 15oz can of diced tomatoes. You can see the step by step photos below this recipe. You can buy freezer safe glass containers at World Market. I think Amazon has them as well. These mason jars that are pictured are not freezer safe. You can also find some BPA freeplastic containers as well. I have frozen tomato sauce in jars (and chicken stock, cooked beans, etc.) for many months. The trick is to use jars that go straight up and down and don't have large "shoulders." Best to use the white plastic caps that Ball makes for storage jars rather than the 2-part canning lids and bands (they can expand as they freeze). How long are they good for in the jars? Do you need to refrigerate them? They need to be refrigerated. They will keep a couple weeks in the fridge, but you can also freeze them for up to 6 months. what is the necessity of peeling them? I have heard the skins get tough if you don't peel them. If you plan to use the tomatoes in a blended dish, then it's probably fine to keep them on? Thanks for sharing. I knew there had to be a reason. What exactly does freezer safe mean? Does it mean the glass will not hold up in the freezer? Some glass containers will not hold up in the freezer. Wondering if I could can them? Can I use a pressure canner? I have never tried, but I don't see why you couldn't? Pingback: Personal Trainer in Allen, Frisco, McKinney, Plano | In Home Personal Training | Trainer In PINK » This Cold Weather Fix! How do you dice tomatoes after the skin and core is done? I chop them with a knife. FYI, you can beautifully preserve in a water bath. I use the pint size rather than the quart. Actually, I am doing this right now. I add green peppers, onion and basil to mine and it works just great. Ask your produce guy/gal to sell you ripe or somewhat bruised tomatoes... mine drops the price significantly for me (.50 cents per lb.) b/c he does not feel they will sell with the "pretty" ones. Good luck! Splendid recipe! Look and taste good. I used a dozen tomatoes, though why do they get soggy once they are out of the pan? I followed the recipe just like it says. I would recommend them anyways. Does the sauce need to cool down before putting it in the jars? And can I use other types of tomatoes? So glad you liked the recipe! They will be soft since they are cooked. I use this recipe in homemade soups and sauces. I'm not sure since I have never tried.